In this VetGirl podcast, we interview Dr. Greg Lisciandro, DABVP, DACVECC about ultrasound techniques in small animal medicine. About to do a FAST ultrasound exam and not sure what to look for? Remember, a FAST exam, the acronym standing for Focused Assessment for Trauma, is simple but not simple-minded. A lot may be gained if you follow a disciplined, systematic approach. In fact more recently, the original FAST exam has been modified using a target organ approach called abdominal FAST or AFAST. Furthermore, a triple T designation for AFAST has been proposed and published since the exam may be used for trauma, triage, and tracking or monitoring. Our guest today is Dr. Greg Lisciandro who developed the AFAST target organ approach along with its abdominal fluid scoring system that helps predict the degree of intra-abdominal hemorrhage. He also developed the thoracic FAST or TFAST exam and most recently has added a third abbreviated technique called Vet BLUE standing for veterinary bedside lung ultrasound exam. Check out this podcast to learn all you need to know about FAST! 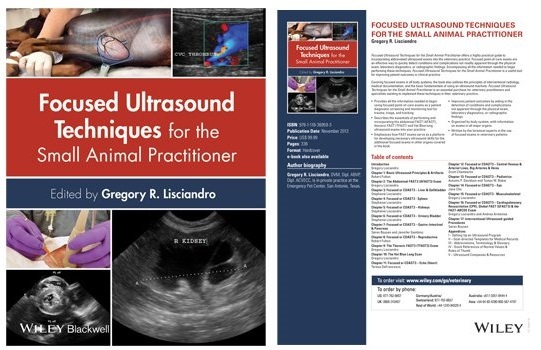 Check out Dr. Lisciandro's book from Wiley here! By following the easily teachable wet lung versus dry lung elementary principle much is gained using the Vet BLUE pattern-based approach. Dry lung is characterized by the presence of a Glide Sign and A-lines (Glide Sign is called lung sliding in people). A-lines are horizontal air reverberation artifacts that extend from the primary white line identified by the Gator Sign orientation. The Gator Sign is imagined through the analogy of the rib heads as the eyes and the bright white line in between being the bridge of the nose as the alligator is partially submgerged below the water’s surface looking at you. The bridge of the nose is your point of focus as it represents the pulmonary-pleural line where, in the absence of pleural space disease, lung glides along the thoracic wall. 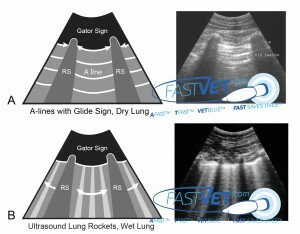 The video clip of the one-eyed gator, by placing the rib head in the middle of the ultrasound field, is a trick that typically rapidly brings out the Glide Sign. The ultrasound beam is thrown in a much different direction with the reflective surface of the bone in the middle of the field and thus the Glide Sign is enhanced. The presence of the Glide Sign with A-lines is dry lung. A-lines without the Glide Sign represents pneumothorax. When unsure, look for the Lung Point (not covered here).